On Saturday afternoon Lolly and I ended up going on an unexpected Mommy Daughter Date. It was nothing spectacular by any means. She just went with me to run a couple of short errands and it was just the two of us. Once you have more than one child it seems to get more difficult to have one on one time. And it's the one on one time you spend that really helps you enjoy that little person for who they really are on their own. Siblings change the dynamic of things and the more people there are, the harder it is for me to concentrate. A.D.D. anyone?! First of all, we went to Saver's. Exciting date destination, I know! I was looking for a specific book and also wanted to pick up some new books for the kids. On the plus side, after a few minutes of wandering, Lolly decided she wanted to ride in the cart and look at books while I looked for more books that were in good condition. Bonus for both of us. Also, the deal of the day, I found a Leap Pad reading system for $3. Go us. Then we headed over to Nordstrom's to pick a little something up (details to follow...again). Little did I know that they were just opening up their new, fancy schmancy store and had a few little extra things going on. In the make-up department they had a free sample (we got lip gloss) and were doing free 2 minute make up touch ups. They actually took at least 30 minutes, but whatever. Lolly insisted that I get this done. I asked her if she wanted to get her make up done and she refused to because she was too little but I had to get mine done. Oh, the things that I sacrifice for my children. Actually, after waiting about 10-15 minutes I suggested that we move along to the rest of the store instead of getting my make up done and she got very upset. So we stayed and I was a little pushy and asked how much longer we had to wait. Shockingly, even though I was standing right there with a stroller and a red head, they had forgotten we were waiting. I guess they could tell that I wasn't actually going to buy anything. ;o) So, we finally got our make up done and the girl who was helping us was so adorable....she put blush and a special pink lipstick on Lolly so we both had our make up done. She was even nice enough to humor me and take a picture of us. It was a wonderful day and I truly enjoyed spending that time with Lolly. And it made me look forward to the future as well....going with my girls for prom dresses and getting make up done for fun and just spending girly time with them. This is one of the many, many benefits of Mommyhood. And, I may not be cool enough, but Happy Love Thursday, anyway! You both look great! And I need to check out the new Nordstroms. Score on the leap pad! What a fun way to spend some time with Lolly. The touch up at Nordstrom's sounds especially fun. Sounds like a great day! And, a great Pic! How super cute are the two of you? I adore this picture. Moms don't always have enough pictures when they are actually in front of the camera, rather than behind it. I am glad you took advantage of your time with Lolly to snap a shot! Look how cute you two are! I love mom and daughter time. And Savers rocks. What a nice post. Love mommy-daughter time as well. HLT ! I agree, after you have one, having any kind of meaningful time with just one child is precious. You both look great! sometimes I really really want a little girl. I am having my surgery tomorrow, and I told the doc that if the Endo is really bad I just want a full hysterectomy. He would not promise me, because he thinks I will regret making that choice in the future. But I am so worried about taking Lupron. I am an absolute nut case on just normal bc pills like yasmin, etc-. Anyways, THANK YOU for posting on my blog. Can I ask you a few questions about your experiences? Email me at lynsiewebb@yahoo.com, if you want to. 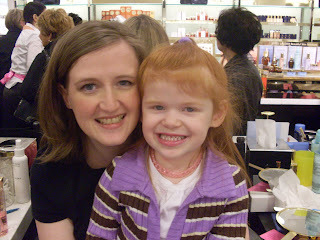 And, by the way, little red headed sweetheart is SO adorable! AWWW HOW CUTE! Seriously,,,she looks like the happiest kid ever!. Where's the new Nordy?